My husband and I went on vacation to beautiful northern Michigan, specifically the west side of the state. It is a gorgeous place with lots of scenery, great weather, and great food. We spent some time with family, including our aunt who has celiac disease. She is always experimenting and making these terrific, gluten-free items. She mentioned to me that she made some bread using King Arthur Gluten-Free Bread mix and that she wanted to use the same dough and try to make cinnamon rolls. Naturally, I was game. What is wonderful about King Arthur gluten free flour is that is available in most grocery stores across the US, and available to purchase online. It was also extremely easy to make. That’s very convenient for someone on vacation with limited room to bring all their gluten-free cooking supplies! 1. Prepare the bread mix according to the package instructions. Preheat your oven to 350F. 2. After bread has its first rise, punch down and mix lightly. 3. Place two large sheets of plastic wrap or wax paper on a flat surface. Spray both sheets generously with cooking spray. 4. Place bread dough on the plastic wrap or wax paper. Using your fingers, spread dough out into a 9×13 rectangle. Dough will be very, very sticky, so frequently moisten your fingers in a bowl of warm water to help with spreading. 5. Brush butter or coconut oil over the dough. Sprinkle cinnamon generously over the dough. Sprinkle brown sugar and white sugar generously all over the dough. 6. Use the wax paper/plastic wrap to assist you in rolling the dough into a cylinder, by holding the vertical corners of paper/plastic and gently rolling it toward you. Be very, very careful in this process to get the most uniform roll possible. You’re probably going to get some seepage of dough out of the wrap. This is fine. You can separate it from the rest of the roll and use it to make a cinnamon biscuit. 7. Using a serrated knife, cut dough into 1 to 1 1/2 inch slices. You may need to run knife through warm water occasionally to help. 8. 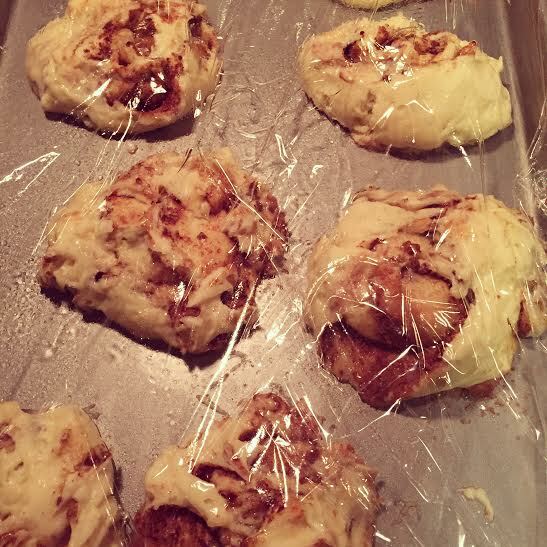 Using a spatula, transfer the rolls to a lightly greased cookie sheet. The rolls may spread a little bit, so after moving all the rolls, use your damp hands to lightly reshape. Rolls rising…see how big they get! 9. Spray wax paper or plastic wrap with cooking spray, cover cookie sheet, and let rise for 20 minutes. 10. After rolls have risen, add to preheated oven and cook for 15-20 minutes. You may need a spatula to check the bottom of the rolls to determine if they are done. Once cooked, remove from oven and allow to cool for 10 minutes. 11. Meanwhile, mix the butter or coconut oil, confectioners sugar, and milk to desired icing consistency. You may need more or less sugar and milk than listed above. 12. After rolls have cooled for 10 minutes, add icing with a brush or simply pour over top. Serve! 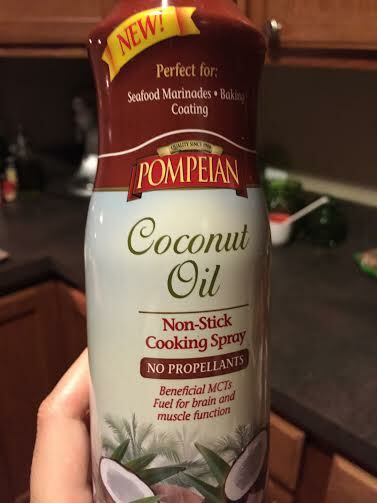 -I normally never use cooking spray for anything, because it can contain chemicals. However, for this recipe, it is absolutely necessary to use some sort of spray to make your plastic wrap/wax paper not stick to this dough. The dough is extremely sticky! If you feel squeamish about using cooking spray, you could make your own. I purchased this brand from my local grocery store. It promises no propellants. -In this recipe, you can use all white sugar, or all brown sugar, or a combination of both. I prefer to use both, but I love a sweet cinnamon roll! -Feel free to add nuts or raisins to your roll. Just prior to rolling, sprinkle them over your cinnamon and sugar mix. -If you find the dough to be too sticky for your liking, you can add more gluten free flour of your choice. After letting the dough rise the first time, punch down and add 1-2 tbsp of other gluten free flour. -These rolls do not come out perfectly shaped and they can be a challenge to work with because the dough is very sticky. However, they rise beautifully, much better than any other gluten free recipe I’ve tried. Learning from a cook who makes gluten-free items all the time was great! She really taught me a lot about the best gluten-free flours, who makes the best mix for what purpose, and how to work with the dough. I hope you all have been having a great summer so far! 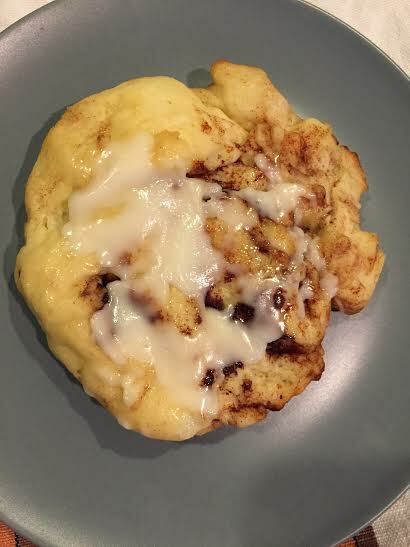 If you end up making the cinnamon rolls, let me know how they turn out by adding your comment below!